Saturdays are the busiest days of the week at D2D, as campus is full with sponsored youth reporting for compulsory weekly programs. Spending Saturdays mornings at D2D provides youth with a supportive and productive out-of-school environment while engaging D2D staff and peers. In an effort to provide additional educational support for youth, D2D has revised its Saturday programming structure this year. The new format aims to strengthen youths’ hard and soft skills to supplement their school lessons. The sponsored students come from different secondary schools, and therefore have varying knowledge level in school subjects. With Saturday lessons, D2D aims to supplement students’ learning and ultimately improve their overall academic performance. In addition to secondary Girls Club lessons, D2D now hosts tutoring and life skills sessions for male and female youth. 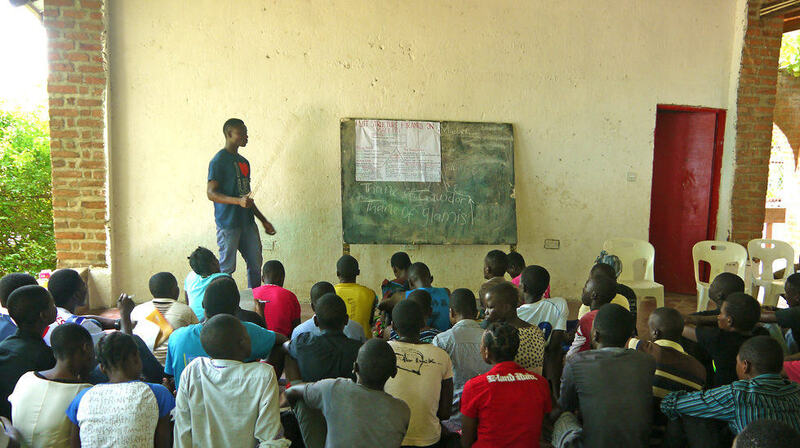 Life skills lessons include topics such as substance abuse, gender stereotypes, and HIV/AIDS education. Tutoring sessions consist of lessons in English, mathematics, physics, and chemistry. Lessons are facilitated by D2D form four finishers who have not yet begun tertiary education and university students still on holiday. Farlington, one of the facilitators, is a third-year student at the University of Livingstonia studying English Education. So far, Farlington has taught lessons on Macbeth and English grammar. Saturday lessons have been beneficial to Farlington in allowing him to practice the teaching skills he will someday use in a classroom of his own. Farlington looks forward to graduating next year, after which he hopes to teach at Wasambo High School. Thus far, the lessons have been received positively by the learners, who appreciate the opportunity to strengthen their education outside of the classroom. The new year is off to a productive start on D2D’s campus, a momentum it hopes to continue in the coming months.